It’s time to experience Ohio’s Amish Country in a new way: through shopping! Take a piece of the culture home with you when you purchase items from the plethora of Ohio Amish Country stores around town. You won’t regret bringing back your favorite, locally made cheeses and handcrafted furniture that will last for decades. Afterward, if your shopping works up an appetite, discover the area’s best restaurants in our complimentary vacation guide! Our guide is full of recommendations on tucked-away cafes, local shops, and everything you need to make the most of your trip. These Amish stores in Ohio are sure to complete your much-deserved shopping spree while staying at the White Oak Inn. From elegantly crafted home decor to the sharpest cheddar you could ever hope for, you’re guaranteed to find everything you want and need at these nearby shops!. Cozy up with locally made, handmade quilts crafted with care. Our favorite quilt shops are sure to have the exact style you want, as well as tools and guides to create your own! Fanatics of antiques will be in heaven in the Amish area. There are so many unique and even historical finds in many of our shops. Come see what catches your eye at these Amish stores in Ohio! For the most recent crafts and goodies, local markets can keep you up to speed on the latest creations. Every time you visit, you’re sure to find something new and exciting. Ready to Stay in Amish Country? 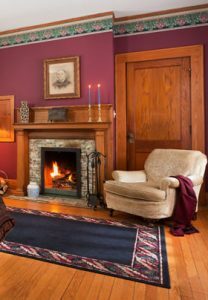 Experience a peaceful, authentic trip when you visit us at the White Oak Inn. Not only are we within a short distance of these Ohio Amish country stores, but we also have accommodations that match the feel of the area perfectly. Consider the White Oak Room, decorated with soothing, dark tones and natural woods that become brightened by the flames of the in-room fireplace. Even indulge in the large, two-person whirlpool Jacuzzi in your spacious bathroom. What better way to relax in Amish Country? It’s time you book your stay! 3 of the Most Unique Places to Propose Near Columbus, Ohio — The Cheese in Ohio Amish Country Is the Best, Hands Down!